It is quite a task if you have different social media handles to attend to especially when it has to do with your online business or digital marketing. These days to successfully manage your business online you need graphic design skills, coding, photography etc.. However, there are a whole lot of online tools to help you achieve this and even make it all easy. with these apps you can create as if you were coding. All you need to create and publish in style is just your smartphone. To run your blog or online shop you need to employ faster cost effective means on the go. Since your smartphone is there, you have your work station. MuseCam is a great app to help you shoot and edit your photos on iOS. It features a bunch of professional feeling camera presets, manual camera controls and advanced tools like HSL and Curves. 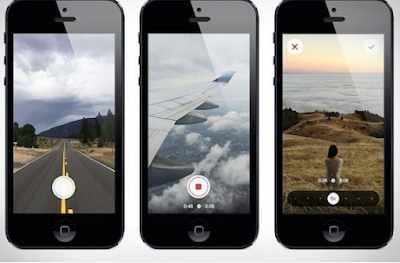 Instagram’s Boomerang app takes a series of photos and creates a GIF-like image. However, there’s one subtle, but super important difference between Boomerang and a GIF. A GIF loops a video over and over again. Whereas a Boomerang, plays a video forward, and then backward, and then loops that continuously. VSCO (formerly VSCO Cam) enables you to capture, edit, share and discover photos. The app features a bunch of high-quality filters to help you get the look you want and also offers a host of free editing tools like fade, clarity, skin tone, tint, sharpen, saturation, temperature and more, each with manual adjustments. Halide is a unique camera app that focuses heavily on enhancing the experience of taking photos on mobile. If you’re looking for the ability to customize your photo taking experience, Manual could be a great option. Manual enables you to adjust shutter speed, ISO and exposure values to create the effect you’re after with ease. Manual also gives you the option to capture images in RAW format, JPEG format or both. If you choose RAW capture, you’ll be able to save images without compression, resulting in a higher quality photo. Hyperlapse (by Instagram) enables you to create tracking shots and fast, time-lapse videos that were previously impossible without bulky tripods and expensive equipment. It’s an incredibly easy-to-use app. All you do is tap the screen to start recording, tap when you’re ready to stop and choose the speed you want the video to play at. You don’t even need to register to use the app. Simply point, shoot, speed up and share. Whether you’re a seasoned photographer or someone who’s barely touched a camera, Camera+ can help you take beautiful photos. Camera+ gives you the opportunity to set exposure separately from focus so that you can easily control how light or dark your shots come out. It also features a range of shooting modes, scenes and pre-set effects. Camera FV-5 is one of the standout cameras available on Android. The app is based on a similar approach to DSLR cameras, putting photographic settings like ISO, white balance, exposure compensation and metering at your fingertips.